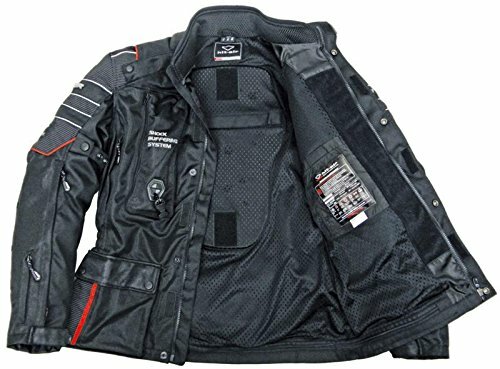 / Hit-Air Motorcycle Airbag Vests & Jackets – Are they worth it? Personal airbag vests isn't a fad that is going away. Hit-Air first started developing these in 1995. These have been supplied to the Japanese, French and Spanish Motorcycle Police, and is spreading to other motorcycle police around the world. Today, Hit-Air make a large range of protective airbag vests and jackets for both bike riders and for equestrian riders. The Hit Air MLV airbag vest is ideal for both motorcycle and equestrian riders. The vests are light weight and designed to be worn over a jacket. Full jacket models with and without sleeves are also available for bike riders. Click the button below to check the current price on Amazon and see any discounts that may be available. Click the link below to see the answer to your most pressing question, or continue scrolling to read the entire article. How do the Airbag Vests and Jackets work? Can Airbag vests go off accidentally? Can a jacket be reused after the airbags inflate? What's the difference between Hit-Air and Helite airbag vests? Which Hit-Air model should you choose? Size Chart - Which Hit Air Size to choose? The Verdict - Are these worth it? 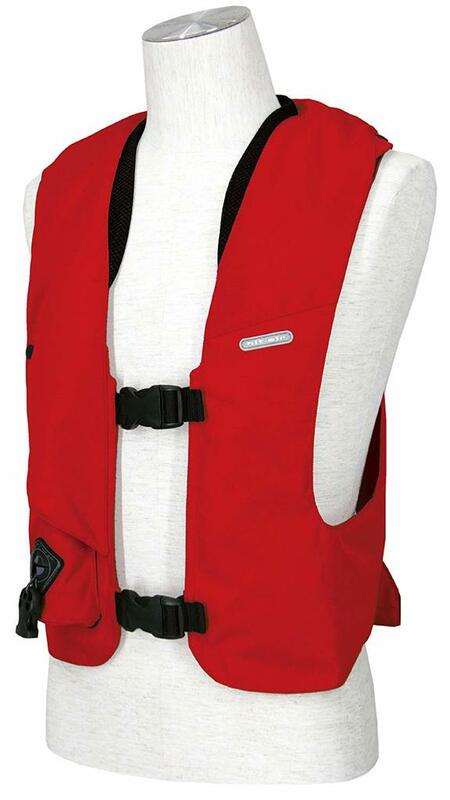 The Hit-Air jacket or vest incorporates a high-speed airbag deployment system. The system is controlled by a coiled wire lanyard. 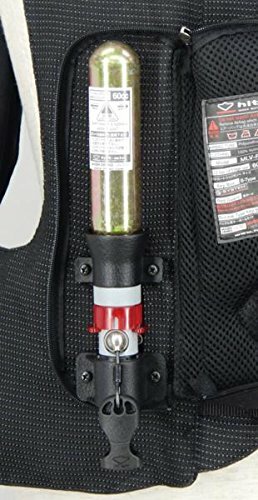 This is easily attached to the structure of the bike and linked to the vest by a quick release connection at the key box unit on the chest of the vest. If the rider and motorcycle become separated during an accident, the airbag is activated. The inflated airbag provides impact protection for the back, neck and chest. It keeps the neck aligned to avoid the whiplash effect and significantly reduces the risks of major spinal injury. A coiled wire pulls a "key" out of a gas release system and inert gas inflates the air cushion. The airbag inflates in .18 milliseconds (0.18 sec). The key box itself acts as a chest protector and can't injure the rider as the airbag is directly beneath it. Due to the design of the connector, the airbag can be activated from any angle or position. 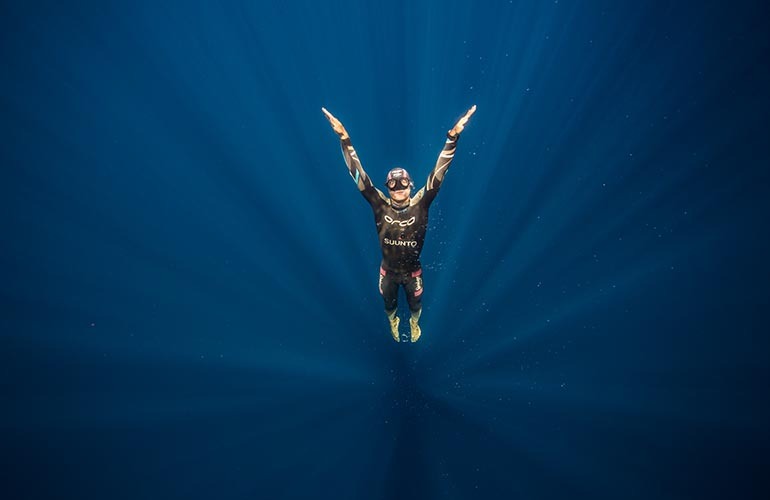 After a few seconds, a release valve will start to slowly release the gas. It generally takes between 3 to 5 minutes to deflate. The airbag won't accidentally deploy if you forget to untether yourself from the bike. Normally, as a rider is dismounting, they'll feel a strong tug to remind them to disconnect the coiled wire. It takes a force of around 66 pound (approximately 30kg) to release the key and deploy the airbag. The wired cord separates completely from the jacket - you will not be dragged by the bike or horse in the event of an accident. The video below shows how the vest tether cord can be attached to any point of the bike. This is shown at 1.44 minute mark in the video. The vests are designed to be used more than once. These are a quality product. As long as there has been no damage to the air bags, the fabric or supports, and the safety mechanisms remain intact, you can reuse it as soon as you replace the CO2 cartridge. The airbag itself is protected by a Kevlar sleeve and is unlikely to be damaged. Once the cartridge has been deployed, the airbags will need to be folded properly and the new cartridge replaced. If there is any damage to the vest you can send it to Hit-Air to be examined. Each new jacket comes with 1 x CO2 cartridge included. Gas cartridges come in different sizes, so be sure to buy the correct size for the jacket or vest when buying replacements. MotoAir and Helite are two other quality and popular manufacturer of airbag vests and jacket safety equipment. 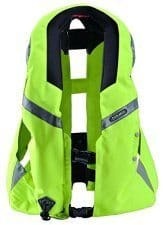 Hit Air vests come with additional plates for the front, rear and sides of the jacket as optional extras. With the Helite vests the armor plates are built in to their jackets, and are not an extra accessory. This is one of the reasons Helite vests are more expensive than Hit Air vests. 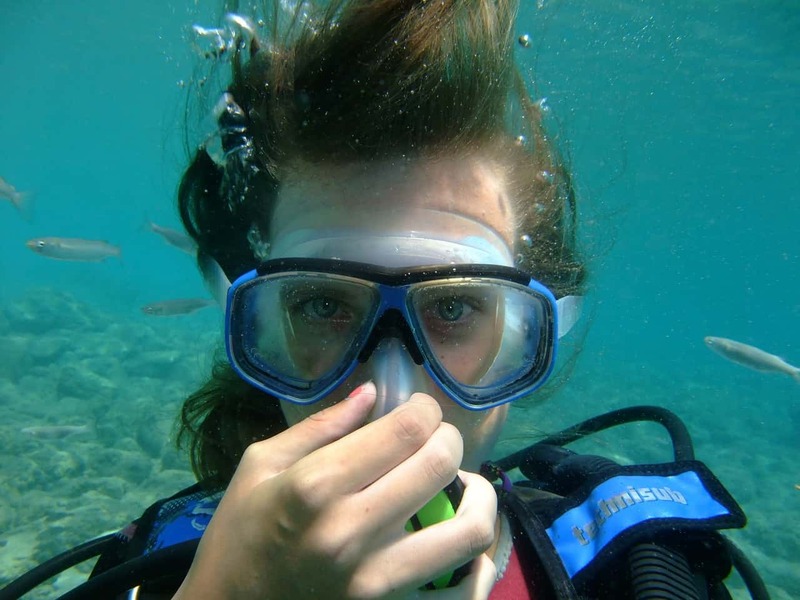 They are also heavier, and hotter which may not suit warmer climates. The Hit Air lightweight vest covers less of your body area when it's not deployed but expands when deployed. 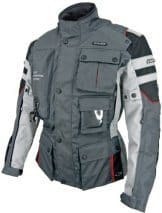 Which is the best motorbike airbag vest or jacket in 2019? 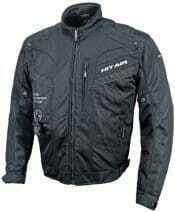 Hit Air make vests and jackets designed for different activities and also for individual rider's preferences. There are motorbike models available for Sport, Touring and regular everyday commuting. The first thing to ask yourself is whether you are looking for an airbag jacket to replace your regular jacket, or something to wear over the top of your current jacket. Hit Air have 18 different vests and jacket designs. An airbag vest worn over a traditional jacket and will prevent the rider's jacket from being stripped off or 'riding up' and exposing skin during an accident. Some riders want Hi-Vis and reflective stripes, while others prefer something that looks just like a regular bikers jacket. Hit Air cover both of these options. There are waterproof or lightweight rain-proof models. Some have removable winter linings. Optional extras include a separate additional waterproof lining, and chest and back protectors. Hit Air Advantage, LV and MLV-SV2 are designed for Equestrian riders. As well as adult sizes, these come in children's sizes and in a greater range of colors. 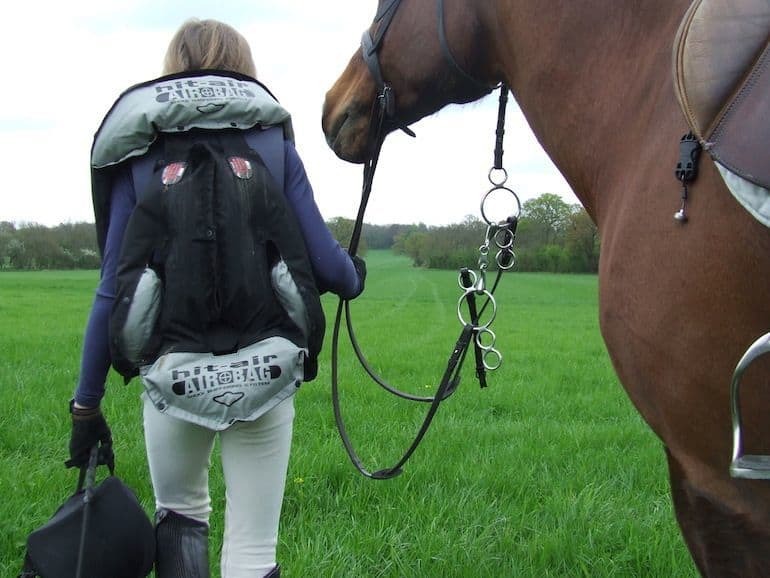 The Equestrian airbag vest has sound insulation in the key box casing where the CO2 Cartridge is stored. This makes it very quiet when it inflates. Even if you forget that you're tethered to the horse as you dismount and it accidentally deploys, it's not loud enough to spook your horse. 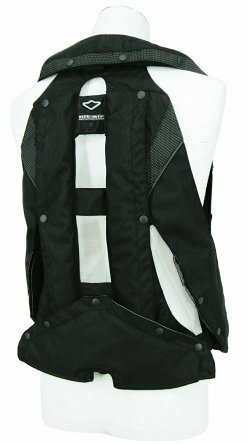 The SV2 Equestrian air vest model comes only in a size Small. 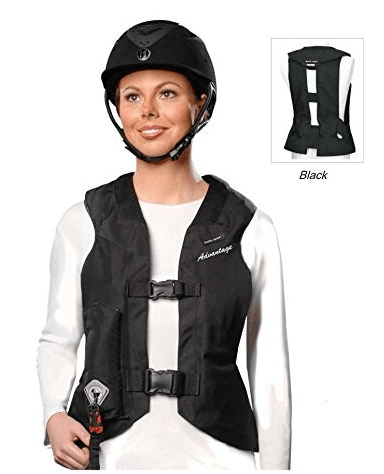 The Hit Air Advantage vest is more versatile than the other Equestrian vests. This one is designed with a wider range of equestrian events and disciplines in mind. It has the option to add extra padding in the chest, back and sides. It comes with either buckles or zippers. The vest with buckles is recommended for English saddles. The zipper option is good for both English and Western style saddles. 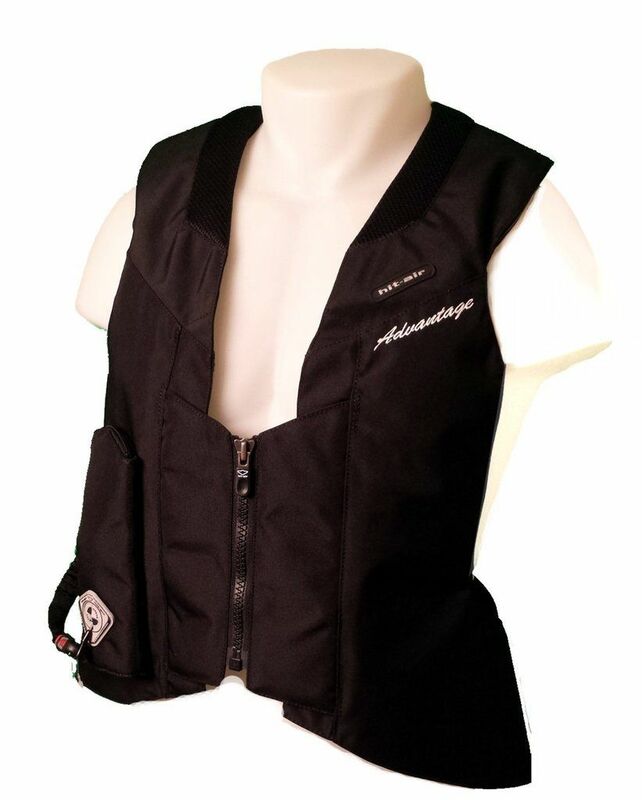 The Advantage vest ranges in size from Small to 3XL. 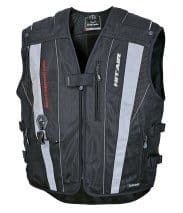 The 4 vests below are lightweight vests for motorcycle riders. These are worn over a traditional motorcycle jacket. The MLV-C vest is also designed for Equestrian riders. The MLV-RC - Reflective is made with Lumidex material. This black material is very bright and reflective at night. During the day, it blends with riding gear and doesn't stand out. 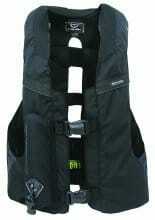 The MLV vest is black. It doesn't have any reflective properties. The MLV-P and the MLV-YC are both super bright yellow with silver reflective bands. The MLV-P has more reflective bands than the MLV-YC. 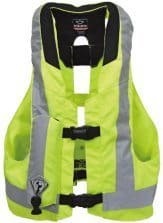 There is a MLV-P model vest which is black with Lumidex, and reflective stripes. The Hit-Air airbag models below are worn as motorcycle jackets. Hit Air MV 6 is an airbag jacket without sleeves, and the MX7 is an airbag jacket with full sleeves. The Hit-Air "Motorad 2" comes in either Grey or Black. The MLV lightweight vests come in two sizes. These are listed as either S-L (or medium) and XL-3XL (or Large). The vests has straps and Velcro to tighten or loosen it over your normal bike jacket. Are these worth it? Absolutely, they are. We hope these are never needed but sometimes accidents are completely unavoidable. You only need to come off your bike once, and you'll be glad you invested in either the full jacket or vest. The Hit-Air vests and jackets strike a good balance between safety, comfort, and looks. 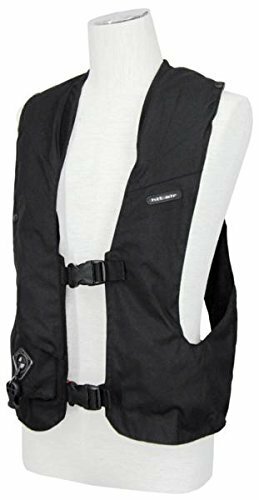 Airbag vests are lightweight and offer great protection. 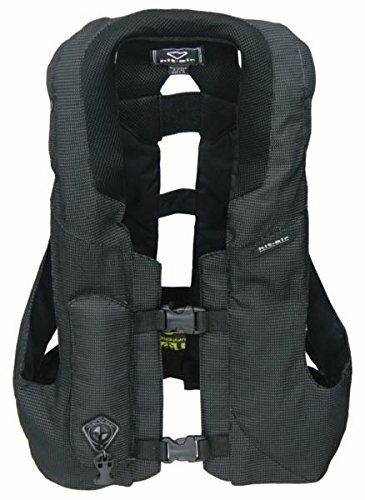 The airbag vests and jackets act as a body air splint to keep the spine immobile – significantly reducing the risks of major spinal injury. This has just arrived in the mail. At first, it was more than I wanted to spend but I don’t really put a price on my safety. I hope and pray I will never have to use it. 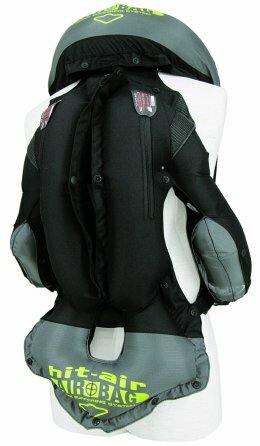 I’d never heard about these until just recently but after I started looking into them, the more I realized this is what I wanted – full neck and spine protection should I come off the bike. Quality seems superb. Bought without regret. I bought this very skeptically. I was worried about size and fit. It fits very nicely over my lightweight riding jacket. I love it. 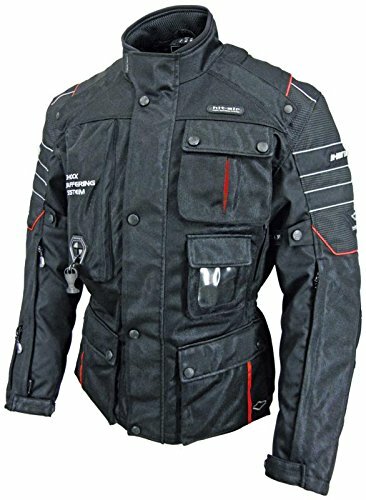 I have this riding jacket and I bought from an online store after reading which size would fit best. It’s lightweight and perfect for traveling. The zips are nice and very durable. Well worth the peace of mind when traveling long distances, or even in congested traffic just going to work each day. I don’t plan on having an accident, but I believe this jacket will help me if I do. I’ve always found these vests interesting. Great concept, but do they really work. I’d love to see some statistics on how much they really protect a motorcyclist in an accident.